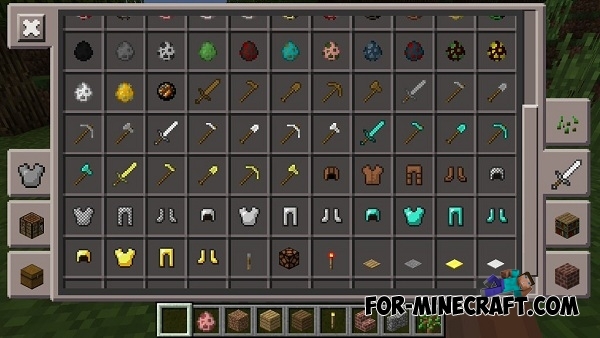 Within a few days Mojang revealed many secrets of the next MCPE update! Typically, developers very rarely post and keep all secrets before the release but not this time. At this time, information is really a lot. We started to talk about horses, rather than about pistons because everyone already knows the information about the pistons from our previous articles, and it is not difficult to guess. Remember how the players were unhappy due to lack of pistons. Hmm, something we digress..
Well, if you look carefully at this screenshot, you will find at first the fireball and yellow horses spawn egg next to the creeper egg. Fireball ignites any block but keeps the fire longer than flint and steel. And yet, players will be able to shoot by these balls with the help of the distributor, and it will be like to ghast attack. And in this screenshot you can see the new ghost archer skeleton! :3 You can read about it in this post. Also wither skeleton probably will be added to the game. After killing him, you can get a nether star. This brings us to the creation of the beacon that will be added in pocket edition (most likely). Polar bears - it really something new and interesting. Bear cub is friendly, but if its beside the the "mother", then "she-bear" will attack the player while protecting their offspring. Yes, it's a new gif img from the development on which are clearly can be seen the piston, which pushes the chest. Probably, players can move some entities. One of the oldest news about pistons (click to read). As Jeb wrote if a player steps on this block similar to the hardened lava, you will take damage. Now enderman will spawn in the nether world. Pistons and sticky pistons with a new animation. Command blocks and mods (perhaps command). 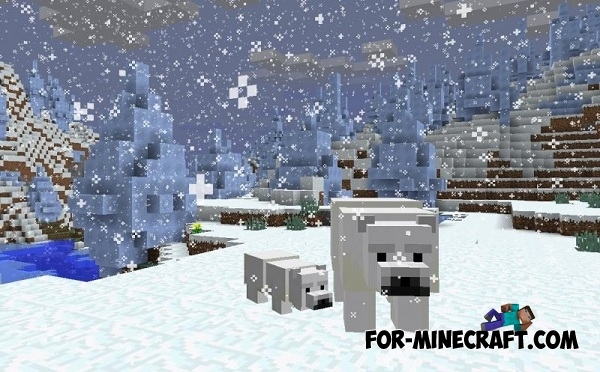 Horses, archer skeletons, wither skeleton and maybe polar bears. Trade and dialogues with villagers. Villages generation in the taiga. Maybe will be added new mobs and blocks. Perhaps the worlds with a height of 256 blocks like PC version. Is an incomplete list, we are following the development of news and we will notify you of any changes! We assume that the MCPE 0.15.0 release will be held in the summer of 2016. Pistons, trade, improved graphics - Minecraft PE 0.15.0It's time to talk about the next version of Minecraft PE 0.15.0 in this post!